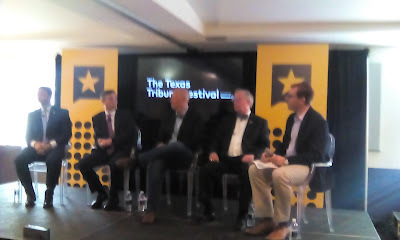 Open seat Congressional candidates Dan Crenshaw, Chip Roy, Van Taylor, and Ron Wright spoke on a panel this morning. It was very encouraging. We only hope they end up serving in the majority. The candidates covered a wide range of topics, the most interesting were federal spending, border issues, and health care. Chip Roy was the first to attack spending. Roy pointed out that, while tax relief/simplification and the resulting economic growth were good things, federal spending remains out-of-control. Out-of-control spending, naturally, leads to debt. And debt remains the largest long-term threat to the U.S. economy. Ron Wright added that "the way we've been funding the federal government is insane." On border issues, Van Taylor made a very important point: Border security, legal immigration, and illegal immigration are separate issues. They should all be treated as such. Trying to solve all three in a "comprehensive" manner is a recipe for disaster. We've also learned from experience that those sorts of bills are impossible to pass. Taylor is correct. The way you solve complex problems is by breaking them into their component parts. Then you solve the component parts. Eventually, you end up solving the big, complex, problem. On health care, Chip Roy finally moved beyond just "repealing Obamacare" to discuss how to actually fix health care. Obviously, this is a point we've been hammering for months. While Roy's full remarks deserve a blog post of their own, the short version is that he spoke in favor of reducing costs and price transparency. Wright added that "we need a system where doctors and patients call the shots." That being said, the person who was really impressive was Dan Crenshaw. This was the first we'd ever heard him speak. He is seriously sharp! We were impressed with his answers to every single question. Especially impressive was his discussion of the defense budget. Crenshaw explained that the military doesn't actually want a lot of that spending. It's nothing but corporate welfare for defense contractors. That's not something you often hear from candidates who are veterans.